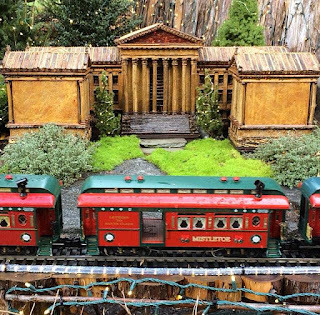 December is here and with holiday activities in full swing, Daily Vacationer knew we had to visit the Holiday Garden Railway at the Morris Arboretum for a wonderful and special seasonal experience. It's a beautiful tradition we just couldn't pass up! 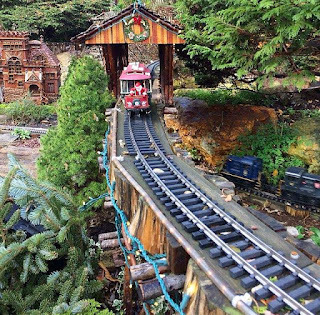 We arrived on a balmy December morning and quickly walked past the Out on a Tree Limb Adventure and headed straight for the Holiday Garden Railway; we were too excited! The Railway has fifteen different rail lines that loop, turn, and twist around buildings, trees, through tunnels, and over bridges. A few things make this Railway so special. First of all, it is situated in a winter garden, not indoors. You stand on a dirt path in the crisp air surrounded by trees, shrubs, and running water and watch trains zip around. 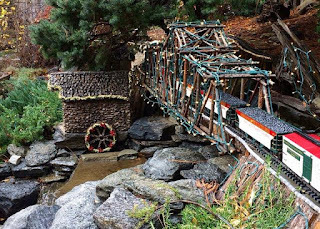 What a delight it is to see the trains disappear through a tree trunk tunnel and cross a bridge by a waterfall. How fun it is to stand under a trestle bridge and watch the train overhead! Senses are heightened as you hear train whistles blow, water fall, and the clickety clack of trains on tracks. Visitors are able to get close to the trains and try to follow them at their leisure. Secondly, the Railway is visually stunning and interesting. It has many well known Philadelphia landmarks beautifully created out of bark, twigs, seeds, stones, resin, and mosses. We were excited to see replicas of the Philadelphia Zoo, Independence Hall, and the Museum of Art to name a few. Signs placed next to other buildings informed us what they were called. In addition to these natural elements, the buildings and structures are adorned with holiday decorations such as miniature candles, wreaths, bows, garland, and lights. 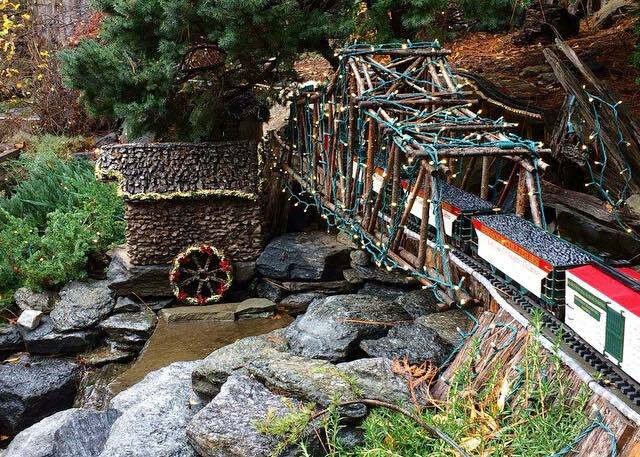 Holiday lights are lit and wrapped around bridges, trees and shrubs as well. 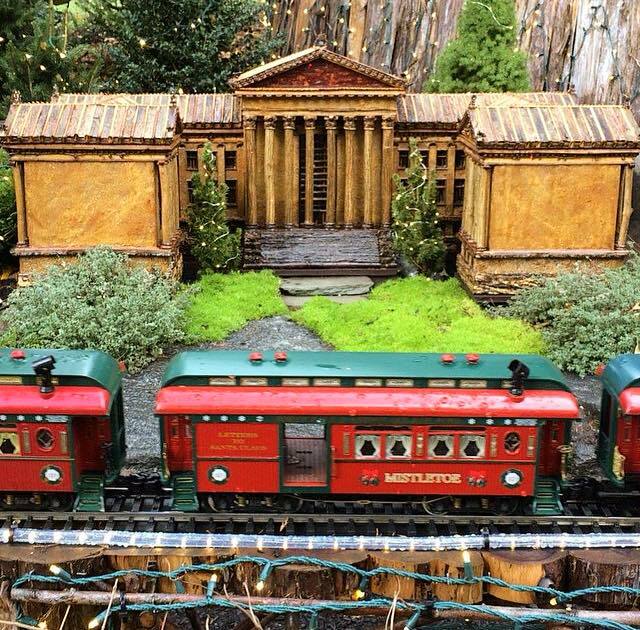 Lastly, we love that both children AND adults will have a great time being here together in the winter garden with the trains. Sure to be a hit with the children are the Thomas and Percy trains, as well as Santa on the back of a trolley! There is something for everyone to enjoy. We loved trying to keep track of the fifteen different rail lines as the trains zipped around the garden! 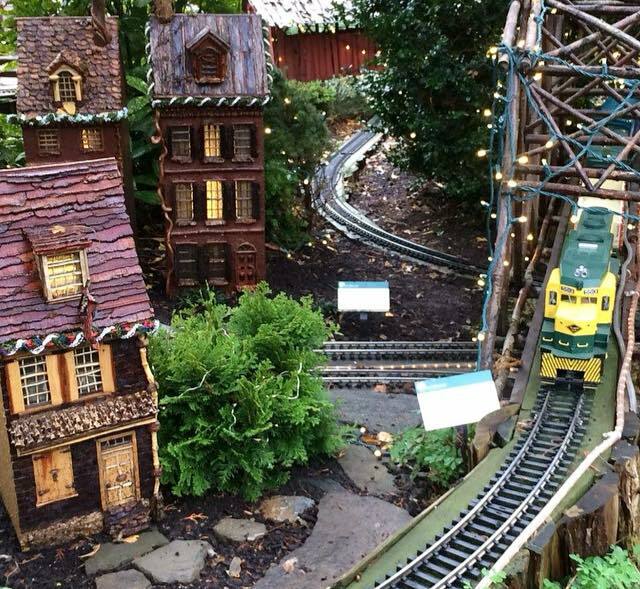 The Holiday Garden Railway also offers a Friday Night Lights experience every Friday evening through December 30th from 4:30 to 7:30. Tickets can be purchased for a specific time and visitors will have a magical experience seeing the Railway lit up in the dark. The Arboretum urges Friday Night Lights visitors to purchase their tickets in advance as the events tend to sell out. Oh my goodness. We need to go here! Thanks for sharing! This looks gorgeous! I would love to take my boys here. Thank you so much for sharing! I need to take my son to this! Thank you for the reminder!! This is a fun place with a two-faced appeal. The top floor at venues in NYC is for all that sass and oomph. It was super packed, but we just wanted to check it out. Loved the solid selection of quality craft beers.